Bacon & Blue Cheese Stuffed Turkey Burgers | Let's Cook With Bry! 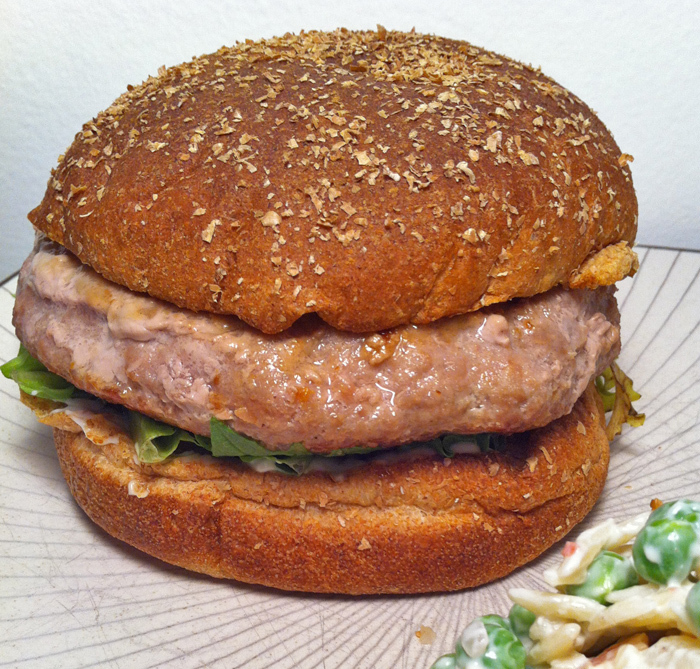 I loves me some turkey burger! My earlier post, Hearty Blue Cheese and Bacon Burgers, calls for incorporating the bacon and blue cheese into the meat mixture. This version is instead stuffed with it, and so the blue cheese melts inside and does not brown or burn due to direct contact with the cooking surface, resulting in a juicy, moist burger. In a medium mixing bowl, mix together the turkey, garlic, salt, Worcestershire sauce, and the dry mustard. 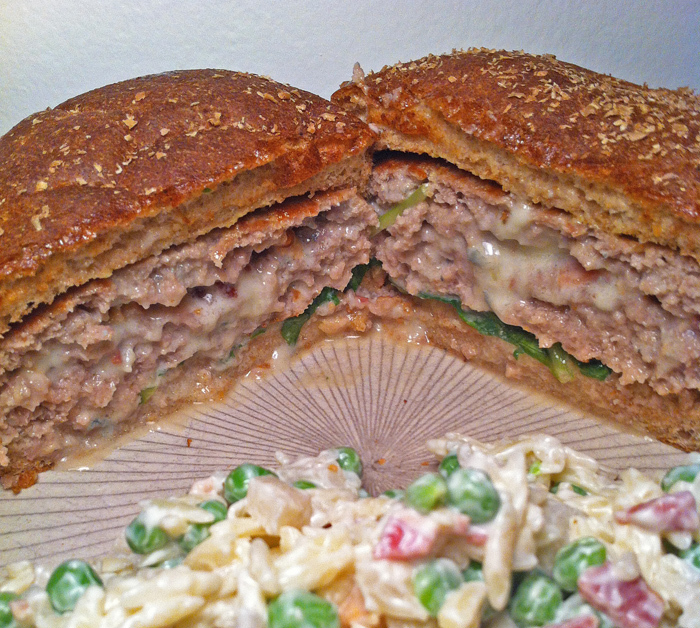 Divide the turkey mixture into 3 equal portions (or 4 if you want smaller burgers). From each portion, form 2 thin patties, creating 6 patties altogether. 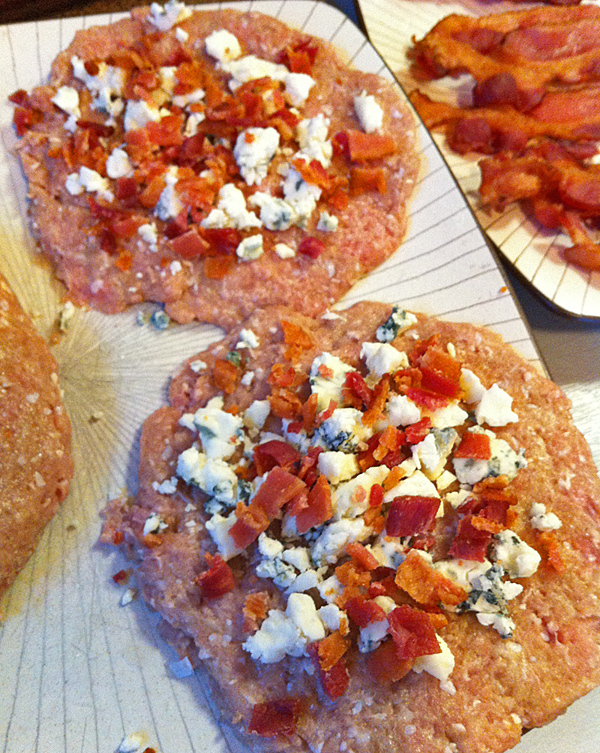 Upon each of 3 of the patties, sprinkle the bacon and blue cheese. Place the other patty on top and press together, being careful to seal all the way around so that the melted blue cheese won’t leak out during cooking. Grill or fry the burgers in a cast-iron skillet or stovetop grill until lightly brown, about 5 – 7 minutes each side. The burger should be firm with an internal temperature of 165°. Remove from the grill and let rest for 5 minutes. Spread each bun with mayo and mustard, place a small bunch of greens atop, and serve. These go great with my Pilfered Pea and Orzo Salad!